Berris Optical offers contact lenses that fit your eyes and your lifestyle. 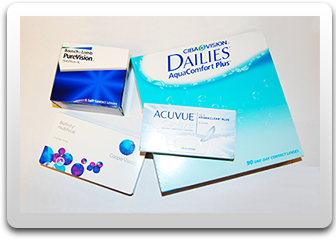 We have a full selection of one-day, two-week, and monthly wear contact lenses, as well as specialty contacts including bifocal, monovision, and astigmatism. We carry the latest contacts lens designs from all of the major manufacturers, including Bausch & Lomb, Ciba, Cooper, and Vistakon. Because of our close relationship with these manufacturers, we are able to offer great rebates on three-, six-, or 12-month supplies of contacts, as well as discounts on multiple boxes. We also offer the convenience of direct shipping to your home. Contact lenses require more than just a routine eye examination and prescription. Your eye doctor needs to understand how you will wear your contacts and must perform several special tests to ensure correct fit, comfort, and safety. First, one of Berris Optical's licensed optometrists will measure the curvature of your eye with a keratometer. The results, sometimes taken together with another computerized measurement of the eye's curve, indicate the proper size and curve for your contact lenses. Your fitting may also include a measurement of the tear film on the front of your eyes. The film is measured to ensure that your eyes have enough moisture to comfortably tolerate contact lenses. Having dry eyes does not automatically mean you can't wear contact lenses it simply means your doctor needs to select a certain type of contact lens or recommend the use of artificial tears. Corneal health is also important to contact lens fitting, and your doctor will check it with a biomicroscope. The test provides a starting point to measure how your eye changes over time and helps to identify any conditions that might make wearing contact lenses difficult. Trial lenses help to fine-tune the type of contact lens you need. Your optometrist will fit you with a lens that meets the requirements of your initial testing and then measure your eye again with the biomicroscope. Through the biomicroscope, she can see how well the contact lenses fit and how much they move when you blink. This information helps her determine your prescription. After you have the correct fit, your optometrist will talk with you about the wearing cycle and proper care for your contact lenses. This is an important part of your complete eye care picture, and it helps ensure that you get the precise set of contact lenses you need. It may take three or four office visits to complete your fitting. Although this is longer than it takes to get a prescription for glasses, it's necessary to safeguard your optical health and provide you with the maximum level of comfort and safety. When your optometrist knows you have the proper fit and correction, she'll give you a prescription for your new contact lenses. Even fully fitted, new contact lenses do slightly reduce the amount of oxygen to your cornea and increase the chance you'll get an eye infection. To keep your eyes at the peak of health, it's important that people who wear contact lenses have an eye exam at least once a year. We're proud of the care we take when fitting every pair of contact lenses. Schedule your appointment with Berris Optical today.